Brief: This beginners guide shows you how to change the default applications in Ubuntu Linux. Installing VLC media player is one of the first few things to do after installing Ubuntu 16.04 for me. One thing I do after installing VLC is to make it the default application so that I can open video file with VLC when I double click it. 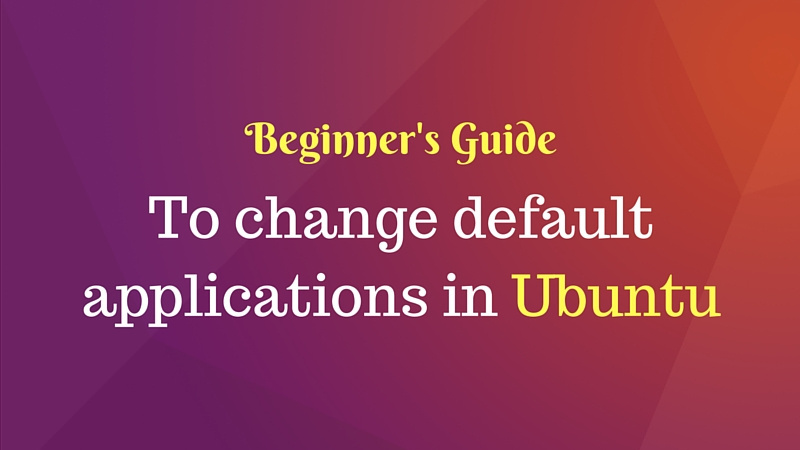 As a beginner, you may need to know how to change any default application in Ubuntu and this is what I am going to show you in today’s tutorial. In here, from the left side pane, select Default Applications. You will see the option to change the default applications in the right side pane. As you can see, there are only a few kinds of default applications that can be changed here. You can change the default applications for web browser, email client, calendar app, music, videos and photo here. What about other kinds of applications? Don’t worry. To change the default applications of other kinds, we’ll use the option in the right click menu. If you have ever used Windows, you might be aware of the “open with” option in the right click menu that allows changing the default applications. We have something similar in Ubuntu Linux as well. Right click on the file that you want to open in a non-default application. Go to properties. And in here, you can select the application that you want to use and set it as default. Easy peasy. Isn’t it? Once you do that, all the files of the same kind will be opened with your chosen default application. I hope you found this beginners tutorial to change default applications in Ubuntu helpful. If you have any questions or suggestions, feel free to drop a comment below.